Before you read our expert insights on Coleman QuikPak K5 Kayak, here is a question for you. Have you ever felt the need to escape the corporate hustle- bustle, the daily commute to work, the endless calls and emails, the 3 feet office cabin and pretty much the same routine day in and day out? There are so many people out there who are stuck in a rut and are not sure of what to do to ‘escape’, albeit for a little while, their day to day lives. Nature is the biggest antidote to stress. It is said that working while looking at the greenery around you can be calming and makes you more productive. But of course, not all of us share the luxury that some afford with cabins that face the nearest park or any other greenery. For those who truly want to break away and reenergize themselves, kayaking is an option that should be explored. If being one with nature is the right prescription for you, then go ahead and start mapping out the nearest lakes/ rivers! And for the gear, we recommend you check out the Sevylor k5 Coleman QuikPak K5 Kayak. 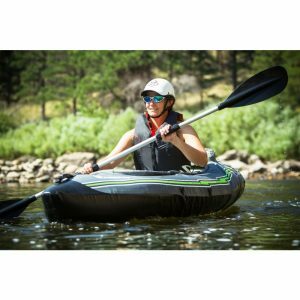 This inflatable one person kayak folds up into a backpack with padded shoulder straps and fits in any car or trunk! Talk about easy portability! 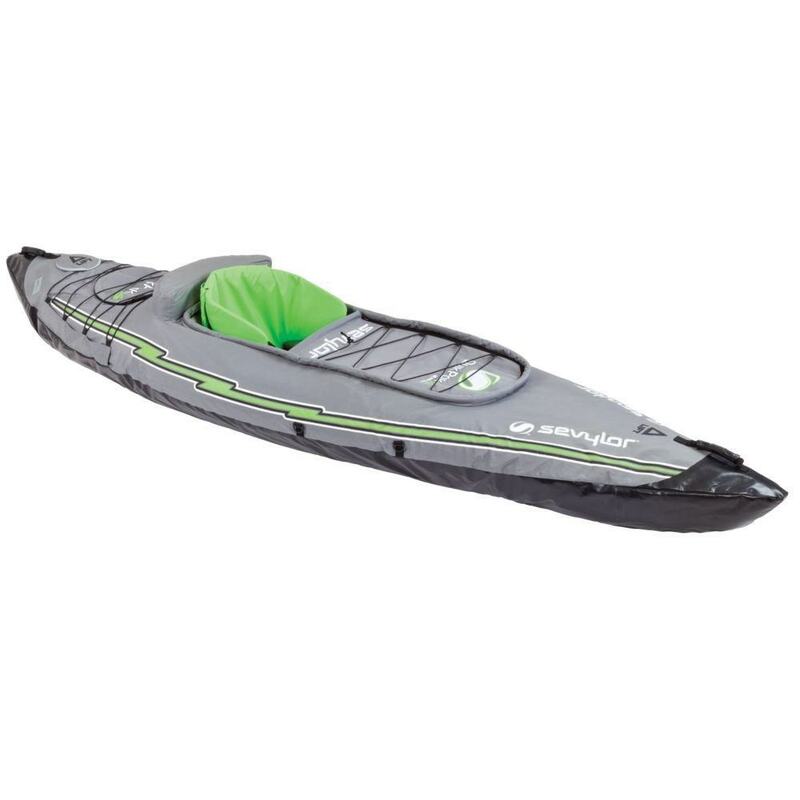 It is easy to set up as well – in no more than 5 minutes; the kayak is up and running for your use! It is important to purchase gear that works for you and your requirements. Listed below are some pros and cons of the Coleman QuikPak K5 Kayak that will help you take an informed decision. Easily inflatable: The Sevylor k5 is designed to assemble easily. Not only does it mould easily into a backpack, but it also inflates quickly. It takes less than 5 minutes for this kayak to be up and running for your use! The makers have maintained the high quality of the product as the air does not leak at all. But just in case it does, the multiple air chambers in the product will keep the kayak afloat and help you reach the shore. 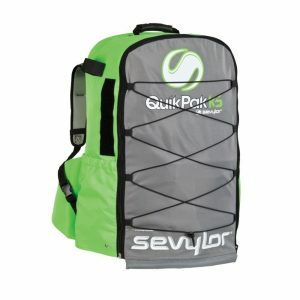 Lightweight: Since it is inflatable, the Sevylor K5 is easier to carry as it is lightweight and can be easily borne by a single person. This feature comes handy when one is travelling independently. Highly responsive manoeuvring: The kayak tracks very well, and you can paddle comfortably and quickly through the waters! The Coleman QuikPak K5 Kayak also works comfortably through rapids and ocean waves alike. So for those seeking adventures on fast moving waters, this is an ideal buy! Sturdy to use: Many users feel wary of using inflatable kayaks as it lacks stability in the waters. Not with the Sevylor K5. Thanks to its PVC construction, the boat is sturdy and makes the user feel secure. Ample storage space: The Sevylor K5 has adequate storage space to store equipment or items you may be carrying. Upon use, we found that the kayak is big enough to store a tent, an extra paddle, the pump, food and water bags, shoes, etc… The D-rings and bungee storage areas are also additional storage areas that you can use. They are located at easily accessible points on the kayak. Spray covers: The product also features multiple spray covers that keep you dry by blocking the water splashes! Weak paddle: The paddle that comes along with the package is sturdy and weak. It is not recommended to use these paddles on rapids! Lack of leg room: The Sevylor K5 could be an inconvenience for people above 6 feet as the legroom is a bit cramped. This could be uncomfortable especially if you plan on boating for long. All in all, the Sevylor k5 Coleman QuikPak K5 Kayak is the perfect gear for your getaway from stress and the mundane life. Considering the easy portability and usage of this product, you can be self-reliant and plan impromptu vacations with ease! This is a highly recommended buy!